I bought this TA02 F-150 from scollins in February this year and built the chassis almost straight away but neglected the body somewhat. I've finally decided to get in and finish it off (after a little prompting). 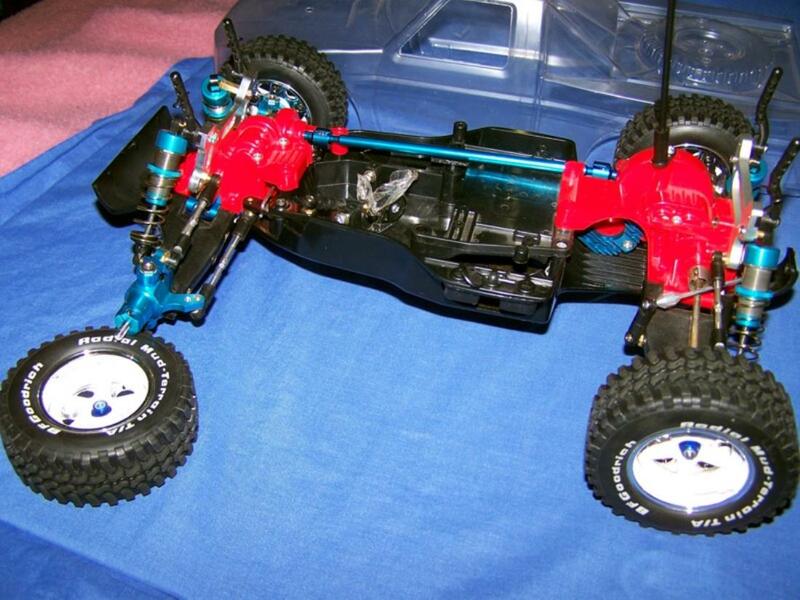 The chassis is a TA02 with DF01 long arm suspension and Thundershot universals. Dampers are Tamiya DF03 fronts all round using the TA02 tourer damper towers. Offers great ground clearance, full suspension travel and the ability to mount the body at the right height without any silly steering issues of using hex drive spacers. Lots of GPM alloy goodies, especially the alloy motor mount and 17T Robinson Racing steel pinion. Wheels are 30mm Tamiya 2-piece. Power of course is supplied by MambaMax 4600Kv on Li-Po with a Futaba S9351 high torque metal gear digital servo to keep it pointed in the right direction. I'm going a few steps further with the body and using an scollins F-350 interior with the windows cut out from body so it's easy to see the interior detail. Steve's interior fits perfectly into this model and clears over the big ESC nicely with the large bulge which was intended to cover the motor of the F-350 3spd. Drivers head is from a Fox (Love this shape helmet). 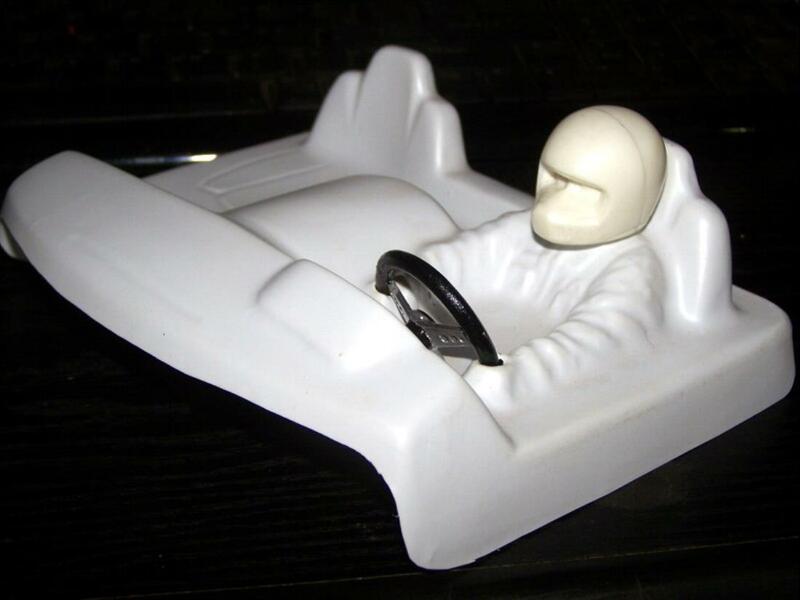 I had all sorts of problems trying to find a suitable sports steering wheel. Necessity is the mother of invention they say, so I decided to scratch build one. I made this from scrap styrene part sprue (wheel rim and column) and some styrene sheet (all the rest). The wheel centre has been turned down in the lathe and the rest by hand with the dremel. I'm real happy with how it turned out and must share. :) It still needs a Ford badge decal stuck to the centre of the wheel to finish it off. I have more planned for the interior and will post up pics as I complete them. 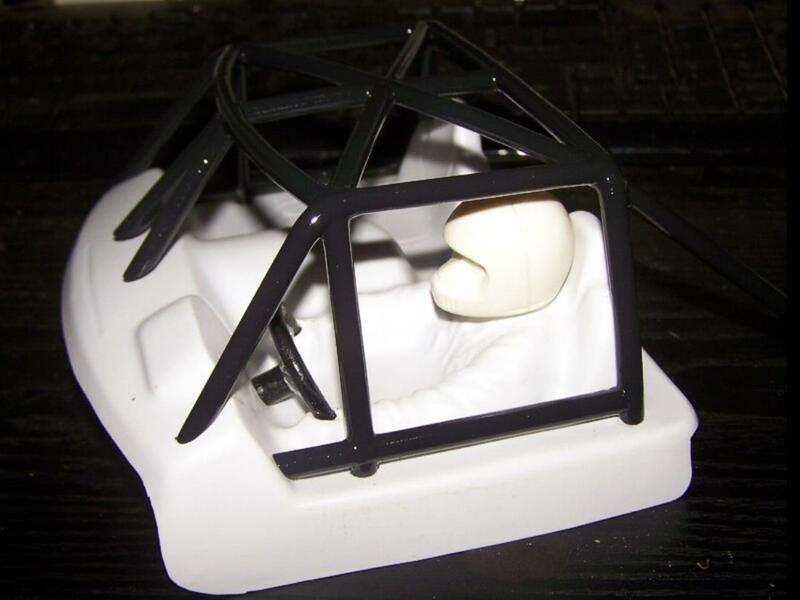 Update 11, Dec: Finished building and painting the interior roll over cage. No Desert Racer Truck sould be without one. It's made from two styrene coathangers that was 9mm tubing, now milled to 7mm diametre. Bent with the soldering iron and bonded with acetate based cement. The major joints are also pinned with metal wire. Secures to the scollins interior via four small screws. It was rather tricky to get the right shape to fit between the scollins interior and the F-150 body, much trial and error before I was happy with the fit. Update 13, Dec: Airbrushed the wheel centres. Metallic gold clear over base and blacked out the plated centres of the 2 piece wheels. Brush painted the nuts around the rim with liquid chrome. 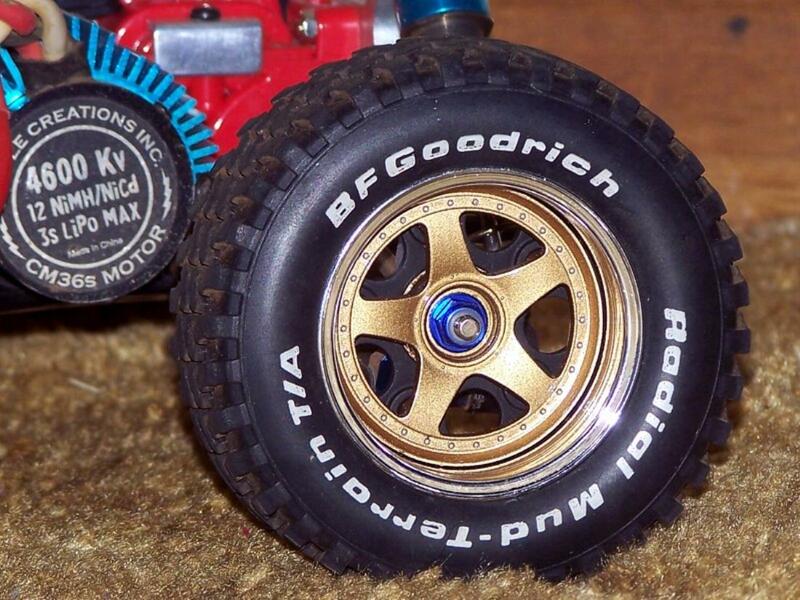 I love these 30mm wheels with these tyres, looks very scale and fills the tyre out nicely. Update 22, Dec: I got most of the interior painted. Since being sick with a flu for the last week I can't get into the RC workshop without sneezing and attempting to cough up a lung. Pic #8 is how far I managed to paint. Made up the window mesh and fitted it. More to come still. Completed chassis minus electrics. 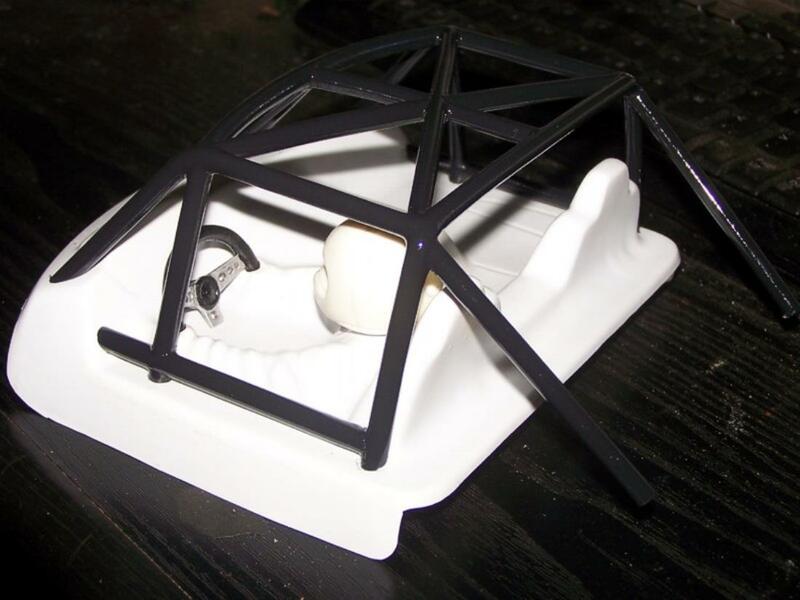 Scratch built steering wheel. Looks good I think for a backyard job. 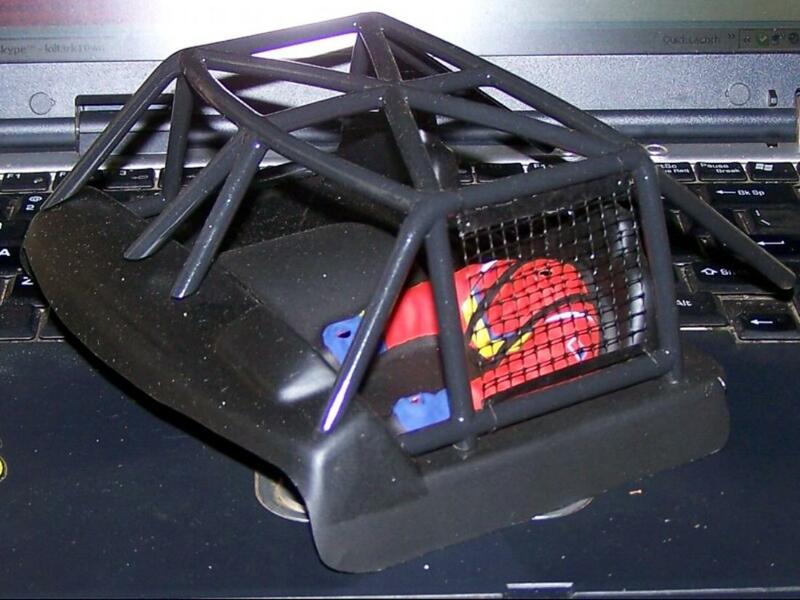 Roll over cage update. Fits nicely to the scollins interior. Pretty wheels, Gearbox brace, Awesome powerplant! This is how far I got before getting the flu. Looks great with all those blue hop up parts on it sweet ride mate. 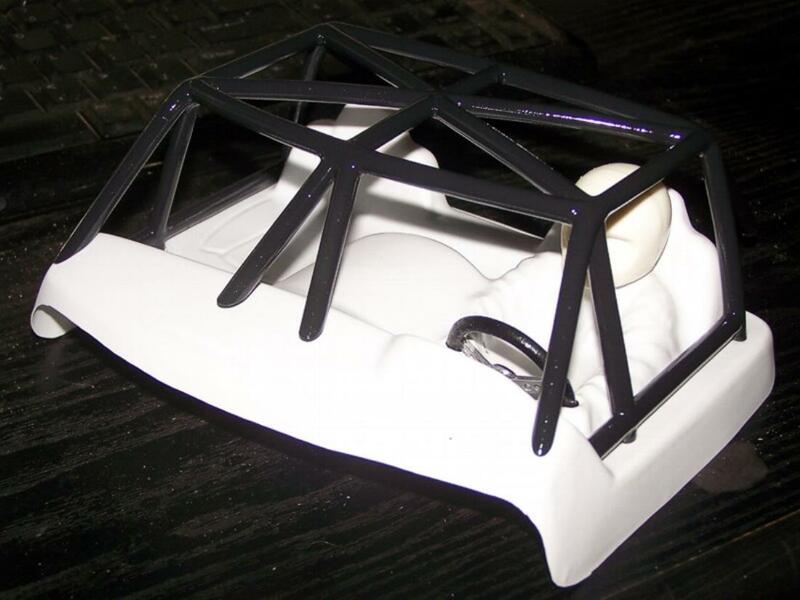 The scratchbuilt steering wheel is perfect scale looks fantastic very nice for a backyard job looks very professional. Cant wait to see this finished should look a treat . That chassis is sweet! I like the idea of using DF01 suspension arms. I'll try it myself. Love the wheels as well, very scalelike. Like the wide stance ... sure its going to handle well...Can't wait to see the finished car! WoW love the rollcage Mark and you scratch built that huh it looks like it was purchased as a factory part excellent job mate very profesional indeed . Cool! Haven't you got pics of the final version of this truck, Mark?